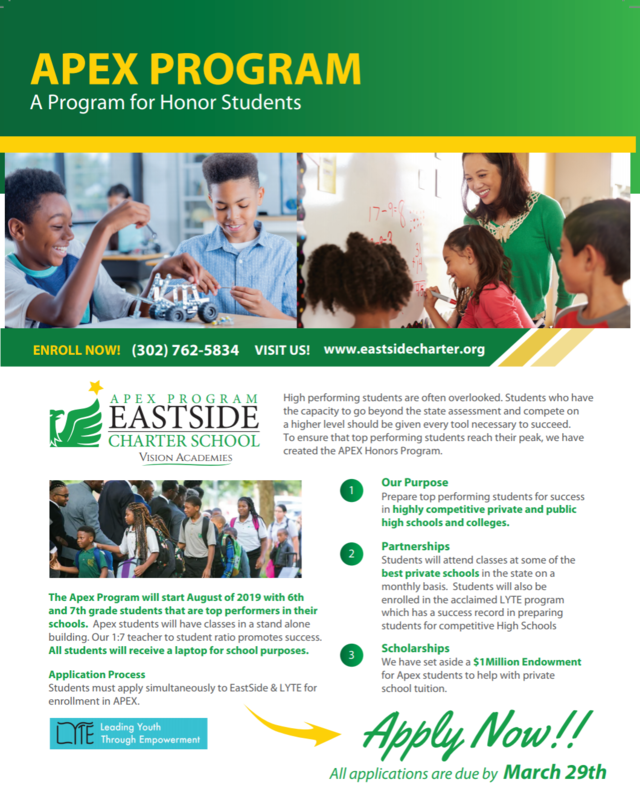 An exciting new program for talented students is coming to EastSide Charter School this Fall. High performing students are often overlooked. Students who have the capacity to go beyond the state assessment and compete on a higher level should be given every tool necessary to succeed. To ensure that top performing students reach their peak, we have created the APEX Honors Program. Please check out the flyer, below; and then click this link to access the Application to be a part of the APEX Program this Fall. We are continuing our tradition of enrollment incentives. Our school seeks enrollment of incredible students for the 2019-20 school year. If you are referring a new family/student(s), please use the link above to provide information for the students you are helping to enroll at our school. Once the child has been fully enrolled we will reach out to you regarding the incentives. Alternatively, enrollees’ families may call Enrollment Coordinator Maritza Ramos @ 302.762.5834; or can reach us through enrollment@escs.K12.de.us. Join us to learn about a career at our school to be a part of the gathering educational momentum of our Scholars. Tuesday 5/14/19, 5:30-7:30pm @ Eastside Charter School, 3000 North Claymont Street, Wilmington … RSVP ONLY TO Maureen.thomas@escs.k12.de.us. EastSide parents: The new 2018-2019 Bus Schedule for all ESCS students in now available. It may be reached through the Bus Schedule link above or by clicking the Bus button at the bottom of this page or the Bus Schedule button on the Parents page (reachable through the Parents drop-down above). Please note … to modify busing for your child(ren), you must complete the Bus Change Form link above. I have things to do, people to impress, and places to go." On the last Friday of the month, students may wear a college shirt with their uniform pants. Keep up with the exploits of the EastSide Charter Eagles on their new website … www.escssports.com. The site provides schedules and other notes of interest on the Eagles. Check back often to get information on rescheduling of games etc. The sports website can also be reached through the green Clubs/Sports Schedules button on this page or the Athletics navigation tab, And, we will now have concessions at all home games - Thursdays are game days at ESCS. ​Uniforms are available for purchase at the ESCS main office starting Monday 8/7 between the hours of 10am and 1pm. Please make sure your child has their correct attire for the year. All students in black pants, PreK = Black shirt, K-4 = Green shirt, 5-8 = Grey shirt. ​The staff at EastSide is thankful for the commitment and support of our parents to our school and their children today and every day. Our work would not be possible without the hard work and dedication parents provide in ensuring their children are cared for and come to school ready to learn each day. We appreciate our partnership with families in this journey as well as the trust our families have placed in us to have their children in our care each day. Thank you for all that you do! Please read the Parent Bulletin every Thursday night as it is part of your child’s homework. This form of communication is very important for us to be successful and for you to be informed of upcoming events at the school. Pre-K Program Awarded Highest Quality Rating! EastSide is extremely proud to announce that it has been awarded a STAR 5 designation for our Pre-K program by the Delaware STARS early childcare rating system! This is the highest quality rating under the State's rating system and EastSide is the first charter school in the state to participate in the program and the first school to receive a level 5 rating. This tremendous accomplishment comes after months of hard work by staff and leadership at EastSide and will have a remarkable impact on our expanding Pre-K program next year! All ESCS students receive free meals. We encourage families to take advantage of this special program. Our meals: contain no pork, peanut or seafood products, use only whole grains, come with 1% white and fat free flavored milk and fresh fruit with every meal. We have created a custom site for our ESCS food service department. You will find it to be an all-inclusive user friendly Nutrition website for students, parents and staff. Please click the School Meals button to access the new food portal and the Food Menus button to view the monthly meal menus.